Continental gold is a clear outlier and, for that reason, I have taken it out. The result is that the average “enterprise value” drops from $17.94 to $4.53 per ounce, and Seafield now shows quite well at a slightly higher EV of $4.60. I have also added a column showing the share price range for the period of the above chart. SFF has lost a little more than 9/10th of its value. Only BAT and RN manage to do far worse. CNL looks to be the most attractive with a share drop of only 50% and a market cap. of $791. By that metric SFF is second to last with a market cap of $13 mln (some of which is not real equity as it was recently borrowed under a Faustian deal). 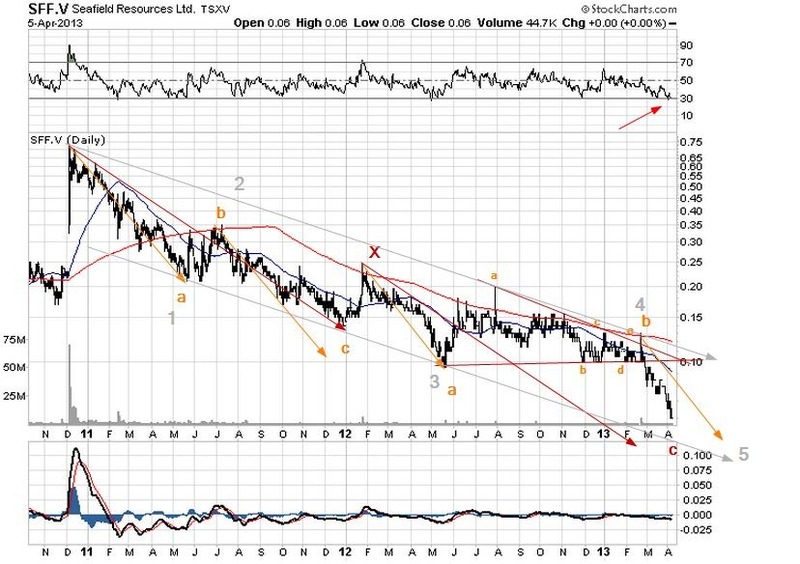 The EW counts , there are more than one, would suggest that the stock is approaching a low, perhaps in the 4 to 5 cents range. That is so close to zero that such a call is essentially immaterial or useless. Nevertheless there is the potential for a double. All call options, warrants and so on, there are some 30 mln. at last count, start at 10 cents and go on to about 30 cents so not much will happen before the stock reaches the lower end of that range. After that desperation may keep a lid on any further gains. To date the company’s only real asset is an EV of $4.60 per ounce calculated on the basis of a property in the bush that now resembles Swiss cheese. It will take another two years and $50 mln. or so before a single ounce is poured. A buy but only with play money.